A new addition to the ST range, the ST6 Evolution delivers outstanding levels of illumination from a unit measuring 284mm in length. 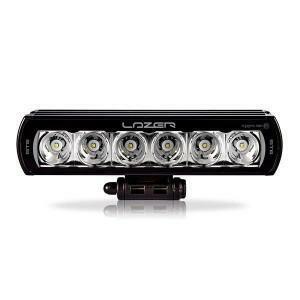 The size of the unit makes it ideal for road and off-road customers looking for significantly increased visibility at night, but where some constraints on the footprint of the mounting location still exist. Fully road legal, the 6 LED unit achieves 1 lux at 340m, but thanks to a low reference mark, will not be constrained in terms of the potential number of lamps installed which can be an issue with some higher reference units. Like all products in the ST range, the ST6 utilises upgraded high-density 11W LEDs which are carefully selected for their high ‘bin’ rating, and deliver 6,204 lumens. Advanced electronic design, combined with sophisticated thermal management systems, and ultra-reflective vacuum-metallised reflectors, harness the light output into a ‘Drive’ beam pattern optimised for lower speed applications where the priority is for good all-round visibility. The colour temperature of the LEDs at 5000 kelvin has also been specifically selected to maximise sharpness and definition, while proven to reduce eye-strain associated with some higher (blue-white) colour temperatures. Performance aside, the ST6 Evolution is built to last. With a 5 year warranty as standard, and a lifetime guarantee on the ‘unbreakable’ polycarbonate lens, which is coated with a hardcoat lacquer to protect against any scratches, the lamp is capable of withstanding the harshest environments. An IP69K rating certifies the lamp will not be subjected to moisture or dust ingress, with additional counter-measures to ensure the unit remains fully contained even in the most extreme of temperatures and humidity. The full aluminium housing gives the lamp its strength and rigidity, while an e-coat pre-treatment provides automotive quality corrosion resistance. Dynamic drive modulation optimises light output considering the thermal conditions of the lamp (preserving the longevity of the LEDs).